The Friends of Prairie Parks serve as a valuable volunteer support organization for the Marion County Park District. Members help to develop and maintain the parks, and also present programs for members and for the public. calendar of events. Outings include trips to rail-trails, canoe trips, and charter fishing excursions. The group also has work outings, business meetings and potluck dinners. 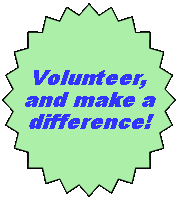 Please consider making a difference in Marion County by joining the Friends of Prairie Parks. Click here for a membership form in Microsoft Word format, or here for a form in Adobe Acrobat format. Trim honeysuckle and other branches back along the trail. Keep others safe by tossing fallen branches off the trail. Organize a weekly walking or bicycling outing along the trail and invite others to join you. Report suspicious activities to the Marion County Sheriff office at (740) 382-8244. Plant and maintain small plant beds at intersections where the trail crosses roads.